For their eighth album, the beloved minstrels of Salento known as Officina Zoè have written a message in a bottle to the sea. Here the Mediterranean serves as an ever-shifting crossroad of symbolic and musical treasures, each element pieced into a narrative of sirens, fishermen, and explorers, whose need for salt outweighs the iron evoked on the 1997 debut album, Terra. Like the waters that inspired them, these songs are massive. Averaging over seven minutes a piece, together they move to the rhythms of an epic tide indeed. 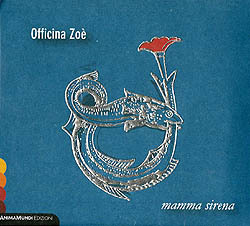 Most of the tunes on Mamma sirena are elaborations of traditional songs, collectively a showcase for vocalist Cinzia Marzo, guitarist Luigi Panico, accordionist Donatello Pisanello, violinist Giorgio Doveri (who, along with Pisanello, also plays mandolin), and percussionists Silvia Gallone and Lamerto Probo. Marzo's relationship with her bandmates is as mutual as a boat on the waves, and reveals connections as distant as Portuguese Fado and as close as Greek folk dances. Such influences abound in songs like “Venti e burrasche” and “Li bellizzi,” in which combinations of accordion, violin, and flute fill canvas upon canvas with receding coastline until a moving image emerges. The sheer reverence in Marzo's cries emboldens every brushstroke with life. Even the zig-zagging patterns of “Mare d'Otrantu mia,” which are the christening of this vessel, have already taken on colors of their destinations at departure. Other songs, like “La marina,” seem to care little for destinations, carving their allegiance instead into the surfaces of escapist fantasies. Marzo brings full-throated clarity to every sunrise on the long journey, even when she navigates with no maps to guide her. In “Fici na nave” and “Fice lu ngegnu,” dirge-like beginnings lead to trance-like excursions lead by violin and wordless seeking, coming to greatest fruition in the joyful “A Nuvaie.” Not all is so upbeat on this voyage, however, as the merciless weight of “Doi lampi” burns its oil long into the night, and the sparkling mandolins of “Comu è bellu” bid intimate farewell at docking. © 2016 RootsWorld. No reproduction of any part of this page or its associated files is permitted without express written permission.